Anti Christ means "Instead of Christ" or "In place of Christ"
"All the World Wondered after the Beast" (Rev.13:3). Satan has duped the people of the world into mistranslating and distorting the Word of God, to create a false gospel, a false image of the Saviour, and a false name: the mark of the Beast (Rev. 13:18). The Devil said "I will be like the Most High." He is the imitation God, and the "idol shepherd". Jesus the Antichrist: Who Changed God's Name? (WARNING). This is not a hate site. It is a site that challenges traditions and exposes falsehoods. This site is not anti-christ. This site does not present anti-Catholic material. It presents factual information. It exposes counterfeits and dupes in regard to religious and biblical interpretation, whether Catholic, Protestant, Jewish, Moslem, Hindu, Buddhist, Athiest, Satanist, New Age, or any other religion, non-religion, or philosophy. THE HOLY SHROUD OF TURIN: CHRIST OR ANTICHRIST by Norbert H. Kox (WARNING). Do not make the mistake and think that Christ is the beast, or the antichrist, or the devil. Yesu Christ is not the 666. 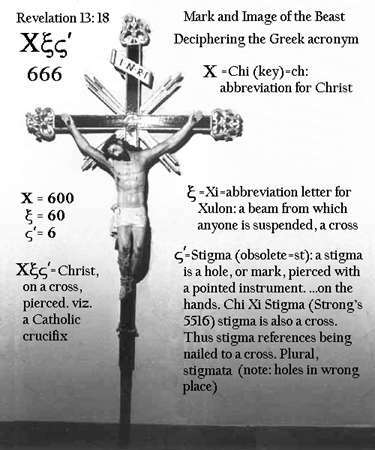 The idols of the crucifix and cross are marks of 666, and the counterfeit name of Jesus is 666, but Christ is not. The cross/crucifix was a curse for us. Christ Yesu took the curse upon himself (Galatians 3:13; Deuteronomy 21: 22-23) being crucified for us: "For he hath made him to be sin for us, who knew no sin; that we might be made the righteousness of God in him." (2 Corinthians 5:21). The entire manuscript is available here.